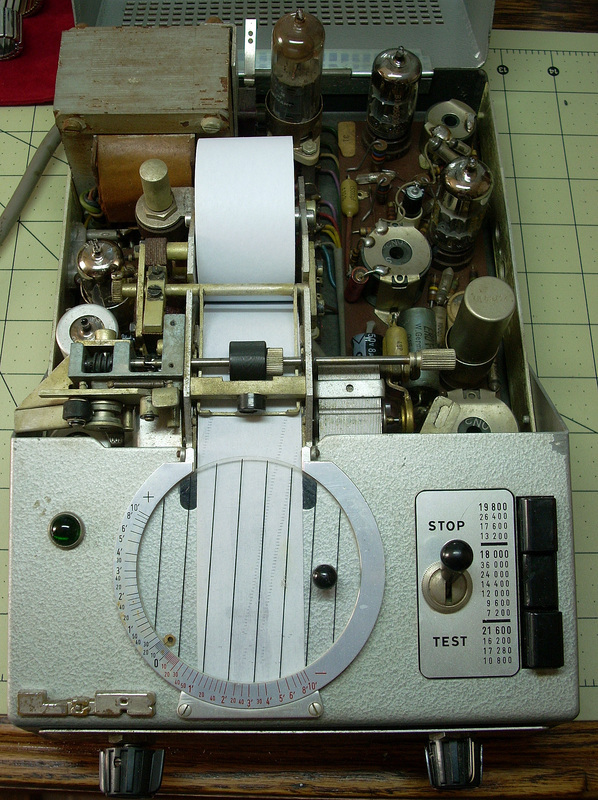 The Tickoprint Standard 2 is a tube-type watch timing machine made in Germany for L&R. Top view of the case and front panel. The inside of the machine before repairs. 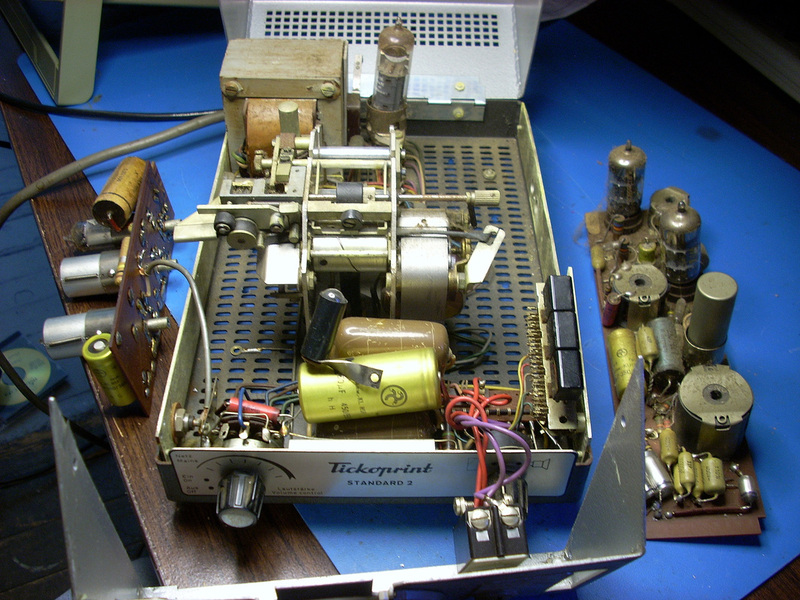 The amplifier and generator boards removed from the chassis. The amplifier board before repairs. The electrolytic capacitors and any out-of-tolerance resistors need to be replaced. I also replaced the large .33uf capacitor, not because it was bad, but because the new replacement was much smaller physically and made for a better fit. A generator board before repairs. 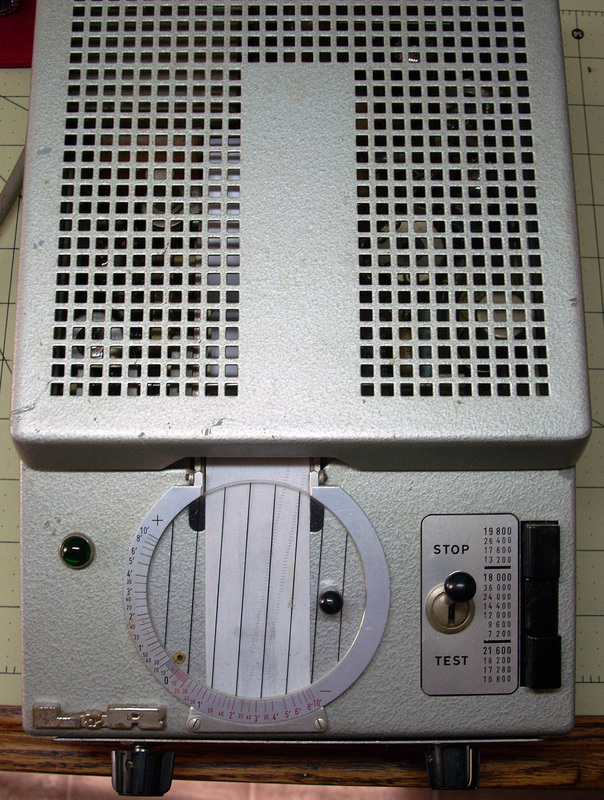 It also has electrolytic capacitors that need replaced and all the resistors checked. A generator board from another unit repaired and cleaned. 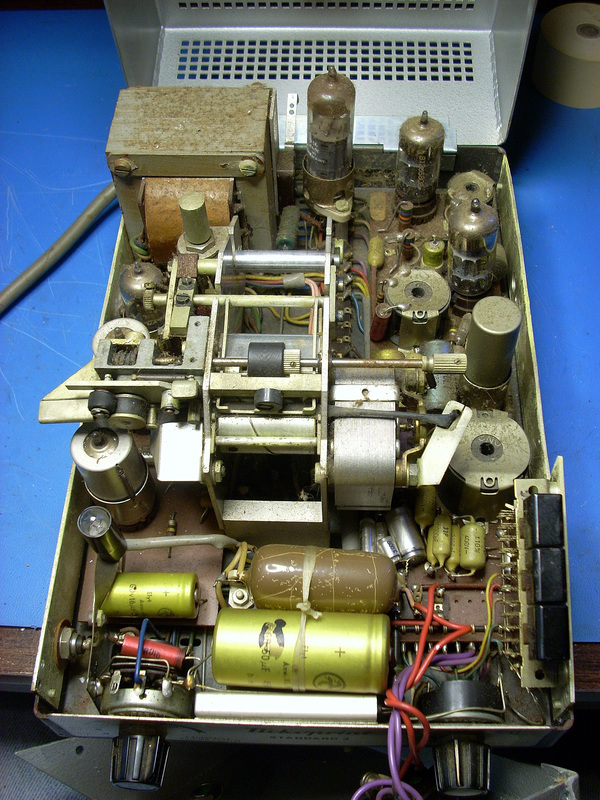 Each generator board was unique in having a different number of capacitors (on the right side of the board) for fine tuning the frequency generator circuit. 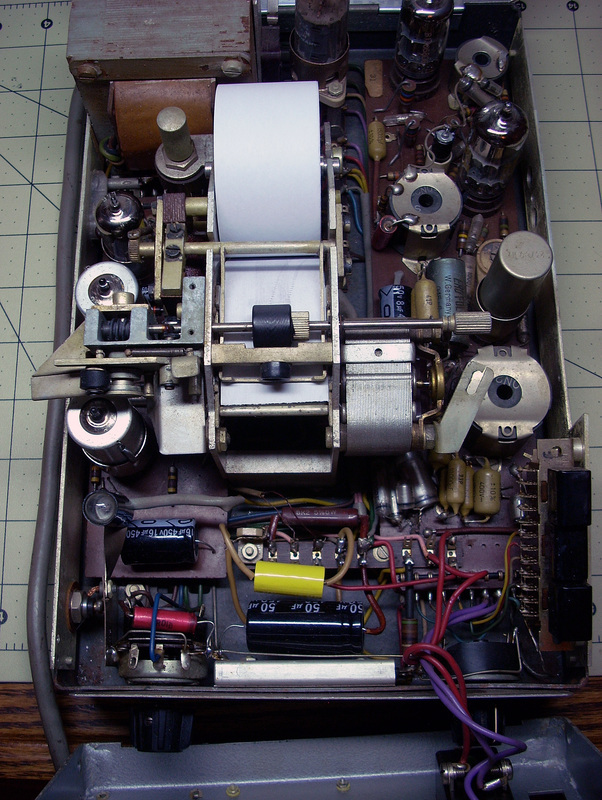 The space in front of the printer mechanism was stuffed with the two monstrous capacitors from the motor drive circuit, plus the high voltage power supply filter capacitor. All three parts have been replaced with new components that are much smaller physically. Repaired and working. The unit can use impact-sensitive paper so the ribbon spool has been removed. 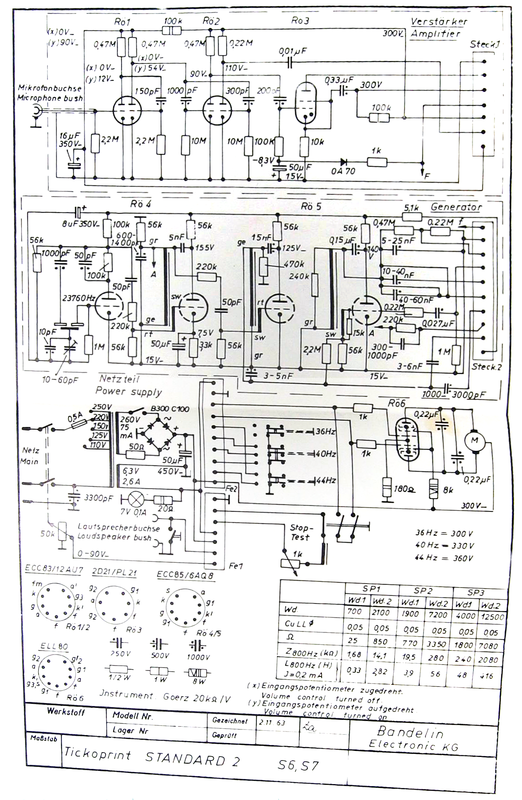 Schematic for the Tickoprint Standard 2. One of the Standard 2 machines had a modification to the motor drive circuit. I'm not sure whether this was a factory-approved mod, but the reason for it is clear - the hard to find and expensive ELL80 dual pentode tube was replaced with a more common and less expensive 6360 dual tetrode tube. The tube socket was rewired to match the 6360 pinout and the cathode resistor was changed to two 820 ohm resistors in parallel.